Your villainous mental twin is Mystique! You lurk around in a deceptive manner, taking on the presence of those around you; but hey, you just happen to know that imitation is the sincerest form of flattery. You're a master strategist and your smarts shine in executed operations, but it's your pokerface that keeps everyone guessing and your guard on the defensive. You're a perceptive mind and know how to read between the lines. It's almost impossible for anyone to hide the way they're feeling from you or what they're implying through body movement... it's almost like you're a mind reader! 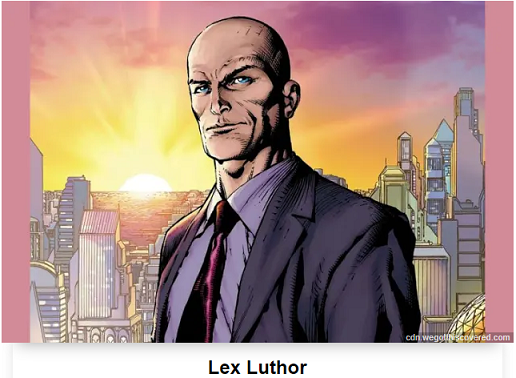 Lex Luthor is your villainous mental twin! Sure, morals and ethics may be lost on you, but your advanced level of intellect overturns super strength any day of the week. Your natural charisma makes you an influential villain, and your strong leadership skills ensure some impressive minions waiting to help you out in the wings. However, as a modern day renaissance man you need no assistance; you can take over the world of business, politics, and finance with your sharp mind. This is the type of triple threat heroes need to watch out for! Lex Luther ...was my result..
Great! I get the ugly old Joker.